The 9th time you have explained that soil and its effects on roots are the key to plant health… Your new landscape company and the difficulty of explaining your well-grounded vision of plant health management…Trying to convince your friends of the elegance of Townes Van Zandt’s lyrics…Getting everyone to see how cool byglalerts are as they show up on your phone…Sometimes only time will tell your truths to the rest of the world. Do not despair: it is always thus. Perseverance…good things will out in the end. 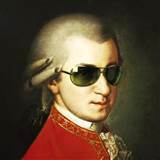 Oh, yes, the quote was from a letter from Archduke Ferdinand’s mother, upon learning of his interest in Mozart, 1771.